I want to convert my pictures on iPhone 5 to a video slideshow for YouTube and Facebook. However the iPhone built-in slideshow feature only allows me to view pictures in slideshow, I can not save it or upload to Facebook. So what is a nice slideshow app for iPhone 5 I can use to share my pictures? If you are searching for a video slideshow maker for iPhone 5 and other iPhone generations, Photo Slideshow Director HD can be a nice choice. With it , you can easily make video slideshows from pictures and music with stunning effects. Of course, Photo Slideshow Director HD enables you to save slideshows to Camera Roll, upload to Facebook, YouTube, Dropbox and SkyDrive for sharing. 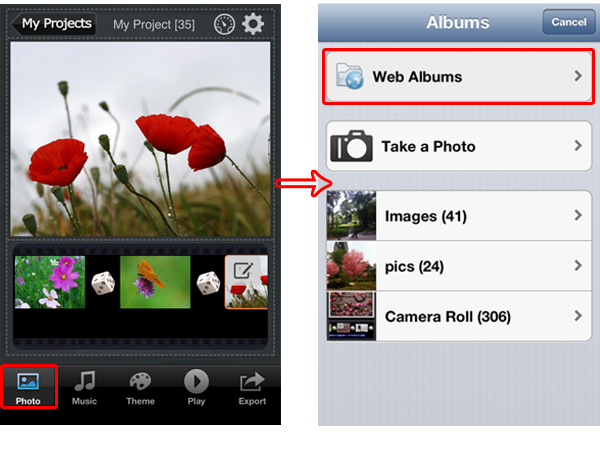 After launching the Photo Slideshow Director HD on your iPhone 5, tap the Photo icon and enable the app to access to your iPhone photos, then you can see all albums in iPhone 5 Photo Library. 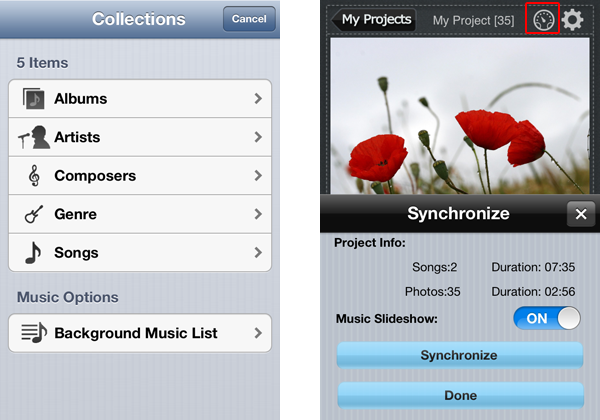 Choose albums and tap photos to import into the slideshow project. If you want to use photos in web albums, tap Web Albums and sign in your web albums, like Picasa, Flickr, Facebook, Dropbox, SkyDrive and Instagram, tap photos to download. Tap Music icon to import songs from iPhone Music Library, you can choose songs by Albums, Artists, Composers . You can see all the songs you added by tapping Background Music List. To make slideshow and music play in pace, you can tap the Synchronization icon and sync slideshow to music. Photo Slideshow Director HD can apply random transitions for all photos, however you can change transitions by tapping the Transition icon(like dice) and choose transitions you like. 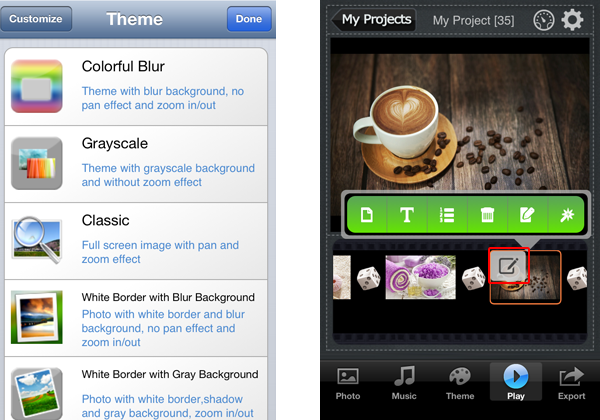 Touch the Theme icon to choose a theme for your slideshow and customize it with beautiful background image. To add text, arrange photo order, delete photos, set pan & zoom effects and edit photos, tap any photo and tap the icon, you will see a menu bar. Tap the Setting icon(like gear), you can set time for slides and transitions. If you want to play your pictures as a looping slideshow on iPhone or TV, you can toggle Repeat at end to ON. Now, it is time to enjoy and share your slideshow. 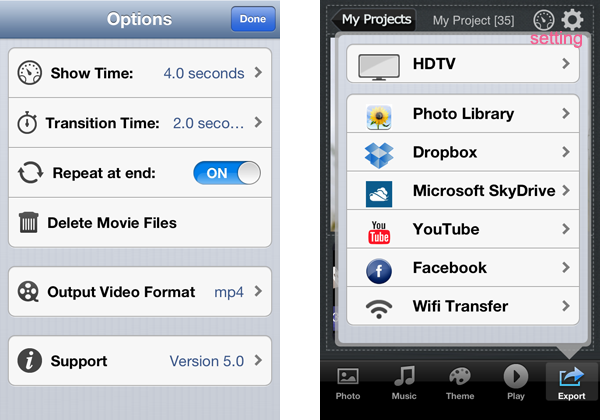 Touch the Export icon and choose how to share your video slideshow. You can stream it to HDTV via Airplay, or Upload to Facebook / YouTube / Dropbox / SkyDrive for sharing, even you can transfer it to PC for enjoying on your computer.